American – Laotian Relations – Patrick F. Clarkin, Ph.D. The United States and Laos continue their longtime cooperation in the search for Americans missing from the Indochina War, on clearance of unexploded ordnance remaining from the war, and on fighting drug addiction and illegal drug trafficking. More recently, the two countries have been working closely together on preventing the emergence of pandemic diseases, and continue to gradually expand military-to-military cooperation following the exchange of defense attachés. Secretary Clinton and Deputy Prime Minister Thongloun Sisoulith welcomed the signing of an “Air Transport Agreement between the Government of the United States of America and the Government of the Lao People’s Democratic Republic” that will facilitate greater trade and tourism exchanges. They discussed the opportunities to expand the role of the U.S. Agency for International Development in the Lao PDR. 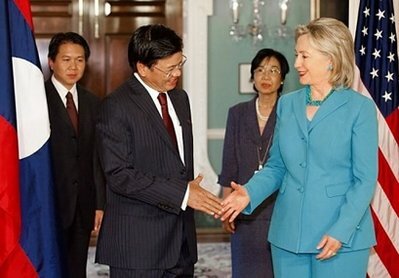 Secretary Clinton was also invited to visit Laos at a time convenient to her. This sounds like good news all around, with the potential for greater dialogue and cooperation. This entry was posted in Laos, Reconciliation, UXO, War and health. Bookmark the permalink.